Equipped with the latest 3-axis stabilisation technology the Removu K1 lets you capture smooth handheld 4K video. Thanks to the 50 cm focal length, the K1 can perfectly focus while shooting a self-portrait. 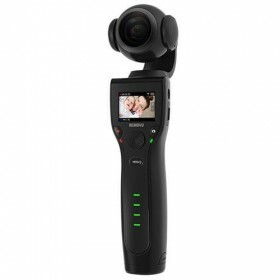 In addition, the K1&apos;s 1.5-inch LCD screen allows you to monitor what your filming. The K1 is equipped with a powerful interchangeable smart battery, providing 4 hours of continuous filming on a single charge. To recharge, all you need is a power source, no bulky chargers are required. You won&apos;t miss another moment. Using the K1 app, you can choose a variety of smart filming features on the K1. Capture your unforgettable moments with the K1&apos;s exclusive features. Still photo modes: Single Shot, Burst Photo, Timelapse Photo (Normal, Motion), Panorama Photo, Selfie.